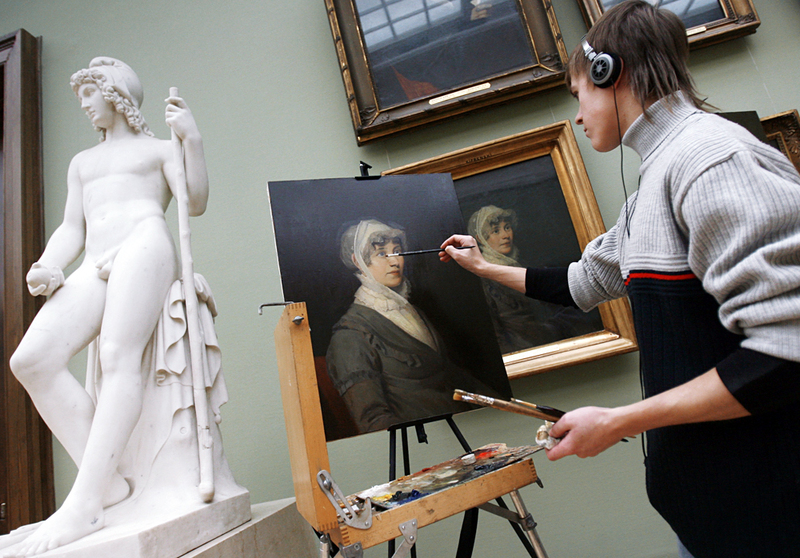 Art school students copying canvases displayed at the Tretyakov Picture Gallery. A teakettle in the style of Zverev or a “Shishkin” forest landscape – the inventiveness of art forgers can only inspire envy. With scandals related to imitations of the Russian classics shocking the art market every year, RBTH looks at the Russian artists whose paintings are most admired by counterfeiters. The masters of the Russian avant-garde – Kazimir Malevich, Wassily Kandinsky and others – are known all over the world. But their fame also attracts swindlers. The works of Malevich, who, according to auction statistics, is the most expensive Russian artist (in 2008 his Suprematist Composition was sold for $60), are particularly favored. One of the most high-profile scandals took place in 2013, when German special services uncovered a group of counterfeiters specializing in avant-garde works. It turned out that more than 400 forged works had been sold. In the same year Russian authorities arrested artist Alexander Chernov and his daughter, who had been able to sell collectors more than 800 fakes. In both cases most of the works were imitations of Malevich. 'A peacock under the bright sun' by Natalia Goncharova, 1911. Source: Tretyakov Gallery. While the number of Malevich fakes is unknown, dubious works attributed to "the Amazon of the Avant-Garde" Natalia Goncharova were even published in European publications a few years ago. In 2010 in the UK art historian Anthony Parton published Goncharova and in 2011 in Belgium cataloguist Denise Baxetoux published the first volume of the catalogue Natalia Goncharova: Her work between tradition and modernity. Both books created a scandal in Russia. Experts from the Tretyakov Gallery and the Russian Museum raised doubts about the authenticity of more than half of the paintings in the books. The number one Russian seascape painter was very popular during his lifetime, which is why a huge number of seascapes were painted in the style of Aivazovsky in the 19th century. Many of them have been passed off in contemporary markets as the master's originals. Furthermore, Aivazovsky was incredibly prolific. We do not have a full catalogue of his works, and art historians still cannot agree on the number of paintings he produced: from 6,000 to 15,000. It is a rare auction of Russian art that lacks one or two of the master's paintings. This helps imitators all over the world constantly flood the market with "new Aivazovsky works." Counterfeiters took advantage of the fact that Ivan Shishkin, who lived in Germany for a long time and painted refined, extremely naturalistic landscapes, worked in the typical manner of 19th-century German painters. While for Russians Shishkin is a great and incomparable master, the European art lover will see in him an average artist from the Dusseldorf school. The scheme that the fraudsters invented was simple: Works in a style similar to Shishkin's were bought at European auctions for 10 to 20,000 euros, the signatures of the European artists were removed, details characteristic of Russian landscapes were added and a "new Shishkin work" appeared on the market costing several hundred thousand euros. Reproductions of certain fakes even made their way into catalogues. For example, this happened to a landscape painting by Norwegian painter Sophus Jacobsen, who had lived and worked in Dusseldorf for a long time. The cannvas was sold at the Van Ham auction house for 13,700 euros, only to become famous some time later as Shishkin's Winter Forest. American art historian and first director of the MOMA in New York Alfred Barr compared Anatoly Zverev with Picasso. Despite the fact that his solo exhibitions were held in Paris and Geneva in the 1960s, in the USSR the artist was not recognized officially. The variety of Zverev's styles creates fecund soil for imitators. However, as absurd as this is, Zverev himself abetted the appearance of fakes. According to renowned painter Dmitri Plavinsky, Zverev's wife painted several dozens (if not hundreds of) paintings of teakettles. Zverev signed the paintings and gave them to conductor Igor Markevich, who in turn took them to Paris. To this day “Zverev teakettles” often go under the hammer in Europe and America that the artist himself never actually painted.